As a clinical laboratory, Dynix Diagnostix understands the complex issues facing healthcare providers today. 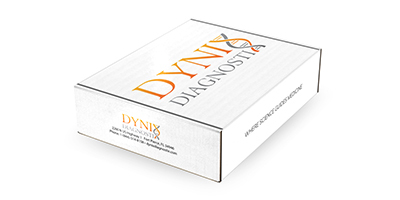 Whether you are a physician, treatment facility owner or hospital representative, Dynix Diagnostix is here to provide the scientific evidence that is needed to ensure that your patients receive the personalized care they deserve. The different modalities of testing that we offer will deliver useful information that can be used to guide an effective treatment plan, thereby ensuring the best outcomes while managing risk. General health tests are essential preventative tools that supply information about health problems at an early stage that have not yet produced any physical signs or symptoms of illness. Numerous conditions can be identified when monitoring your general health including: Liver disorders, diabetes, thyroid disease, anemia, leukemia, and so on. Click on the Comprehensive Wellness Panel to learn more. All the benefits of genetic science brought right to the privacy of your home. Please visit the Cancer Genomics CGx page under testing modalities to learn more. Genetic testing will help forecast your risk of developing a particular disease, help you discover if you have genes that may pass increased cancer risk to your children, manage risk, and develop a preventative action plan. Tip: Enter between 80 - 300 characters. Dynix Diagnostix is an industry leading, full-service clinical laboratory. We deliver quality service and efficient results for molecular genetics, blood testing, toxicology, and pathology.